If you have a daring palate, cow tongue might be featured on your dinner table. However, like other organ meats, cow tongue should make only occasional appearances in your diet; consuming organ meats on a regular basis is unhealthy because of their cholesterol content. Cholesterol aside, cow tongue does offer some advantages, providing protein, vitamins and minerals. Cow tongue offers some health advantages by increasing your iron and zinc consumption. Both iron and zinc maintain your health — zinc boosts your immune system so that your body is able to fight off infection, while iron prevents anemia, a condition characterized by reduced oxygen transport, which causes fatigue. Iron also helps your cells produce energy, while zinc supports wound healing. A 3-ounce serving of simmered cow tongue contains 3.5 milligrams of zinc, which contributes 44 percent toward the daily recommended zinc intake for women and 32 percent for men. Each portion of cooked cow tongue also boasts 2.2 milligrams of iron — 28 and 12 percent of the daily iron intakes set for men and women, respectively. Cow tongue's choline and vitamin B-12 content also makes it an advantageous addition to your meal plans. Both choline and B-12 play a role in nervous system health — vitamin B-12 helps you make myelin that insulates your nerves, while choline makes up a component of chemicals needed for nerve communication. Each 3-ounce portion of cooked tongue adds 2.7 micrograms of vitamin B-12 to your daily intake, and just one serving ensures you'll get the 2.4 micrograms needed daily. A serving of cow tongue also contains 132 milligrams of choline — 24 percent of the recommended daily choline intake for men and 31 percent for women. Including cow tongue in your diet also helps you consume more protein. Each 3-ounce serving contains 16.4 grams of protein and, like other animal-based protein, it provides all the essential amino acids. 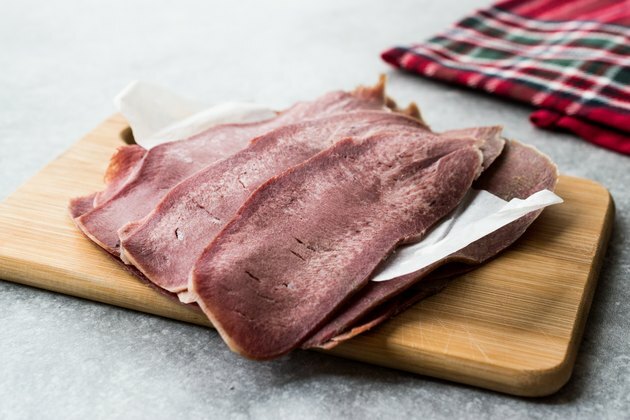 This means that the protein in cow tongue provides all the building blocks your cells need to assemble new proteins in your tissue — a process that promotes tissue strength, maintains your hormone balance and helps you make antibodies essential for immune function. The amount of protein in one serving of cow tongue makes 27 percent of the daily requirements for a 165-pound person. While it's advantageous when consumed in moderation, cow tongue's fat and cholesterol content has some drawbacks. Each 3-ounce serving of cooked cow tongue comes loaded with 19 grams of total fat, including 6.9 grams of saturated fat. This makes up almost one-third of your daily limit, based on a 2,000-calorie diet. Cow tongue also contains 112 milligrams of cholesterol per serving, which is 37 percent of the daily limit. Watch your portion size when consuming cow tongue to avoid eating too much cholesterol and saturated fat — they increase your blood cholesterol, which boosts your cardiovascular disease risk.